For a few months now I’ve focused on what good leadership is to me and to co-workers and read quite some bit about Emotional Intelligence vs IQ and Mindfulness. I even followed some training on these topics. The main tools I use to consolidate all my news is Flipboard, so I created a Flipboard Magazine for all feeds regarding that what MindJudo focuses on. A thing I was looking into is how a good leader motivates people and teams, and what it is that motivates us individually. Definitions on motivation vary widely, with elements including commitment, goal alignment, enjoyment, and performance, just to name a few. Despite the fuzziness surrounding employee engagement, organizations spend more each year trying to solve the puzzle of developing a motivated and engaged workforce. It’s clearly a complex issue that seems to get more complicated by the day. Trust is the foundation of any successful, healthy, thriving relationship and it’s essential to your success as a leader. The Great Place to Work Institute has documented that committed and engaged employees who trust their management perform 20% better and are 87% less likely to leave the organization. What does that mean for leaders? To a large extent, the way you lead your people has a dramatic impact on their level of engagement on the job. Autonomy, relatedness, and competence are three of the main factors that shape a person’s motivation and the level of trust you have in the relationships with your team members has a direct influence on the quality of each. Relatedness – We are hardwired to have interpersonal connections with other people to one degree or another. Your people are much more than worker drones showing up to do a job for eight hours. They are complex, rich, dynamic people with amazing life stories and the relationships they have at work are primary threads in the tapestry of their lives. When it comes to trust, there are two layers of relatedness: proximal and distal. Proximal trust is the trust you have in your relationships with your immediate boss and co-workers, and distal trust is the trust you have with your boss’s boss or those at even higher levels. A primary way to foster trust with your people (in both proximal and distal contexts) is demonstrating care and concern for relationships. Praise, recognition, and building personal rapport are all great steps in building trust. Also, make the effort to share more information about yourself and the organization to increase transparency and authenticity with your team. 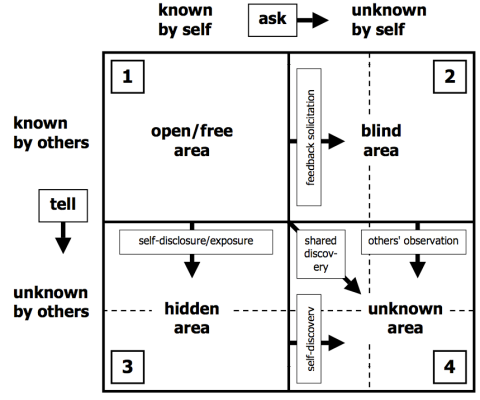 The Johari Window (below) is a helpful model that illustrates how you can improve communication and build trust with others by disclosing information about yourself.